Carte Generale de la Maritinique. 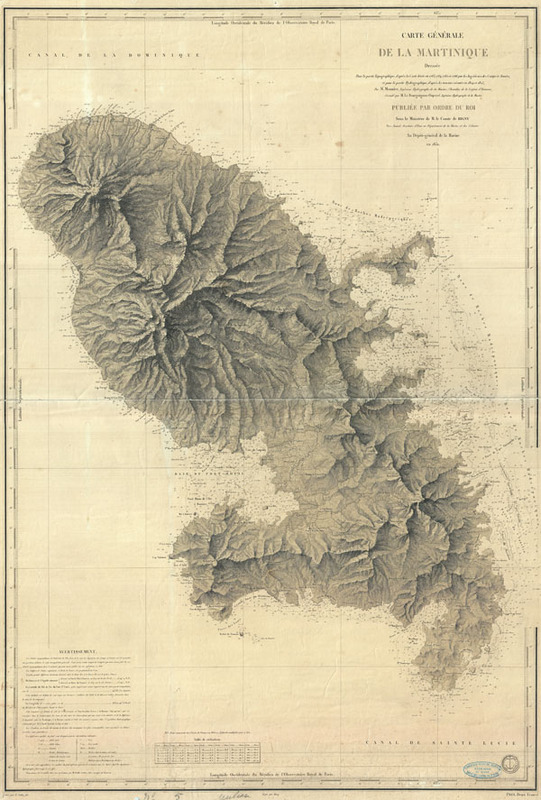 A beautiful French nautical chart or map of Martinique issued in 1831 by the Depot de la Marine. Offers sumptuous detail both inland at sea. There are countess depth soundings as well as notes on undersea features such as banks and shoals. Equally impressive detail inland with beautifully engraved topography throughout. Today Martinique, with its French Caribbean culture, lush rainforests, and stunning beaches is considered a jewel of the Caribbean. Issued by M. Monnier and M. Le Bourguignon-Duperre for the Depot-general de la Marine in 1831. Good. Full centerfold repair. Minor repairs to margins. Oveall toning.